Ulsan is a port city located in southeastern region of Korea. It is considered to be an industrial city. 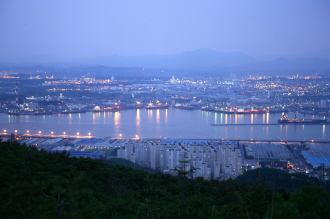 12.2% of the manufacturing industry of Korea is located in the Ulsan area. It is a harbor city and has a national airport. Ulsan city got its name, Ulsan for the first time during the 13th year of Taejong (year 1413). Since then, Ulsan was promoted to Ulsan-eup on April 1, 1931 and to Ulsan city in June 1, 1962. Green belt divides Ulsan Metropolitan city between theo downtown area and farming and fishing villages. Downtown Ulsan is divided into new and old Ulsan. The Naewonam Valley on Mt. Daeun is well known for its scenic views. Lakes, waterfalls, and overal mountain scenery is amazing. On the upper Taehwa River (Ibbam-ri, Beomseo-eup) you can find a strange standing rock suddenly rissing from the water. It is believed that once a white dragon lived here. Jakkwaecheon is a stream running from the 1083 meter high Gan-wol mountain towards the sea. Famous for it's clear water, rocks and beautiful scenery. It is located 3 km from Eonyang to the central-south. Turn to the west road and look for a tunnel of cherry trees, pass this tunnel and you will find Jak-chun-jung.